I love Katy Regnery books and I love fairytale re-tellings. 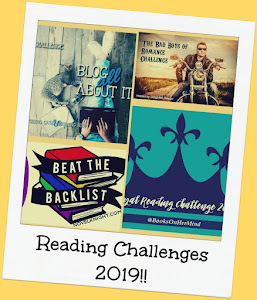 You get magic people... And you should add some magic to your Goodreads! Fragments of Ash is an adult contemporary romance and it is available now! Below, you'll find my thoughts on the book, author info and a giveaway (courtesy of Katy Regnery). Possibly... The stepfather wrong on so many levels and there was more than one thing that made my skin crawl. A little but it's very much in the backseat of this story, not the focus. Everyone knows that fairy tales are a mix of sweet underscored by a core of ugly. 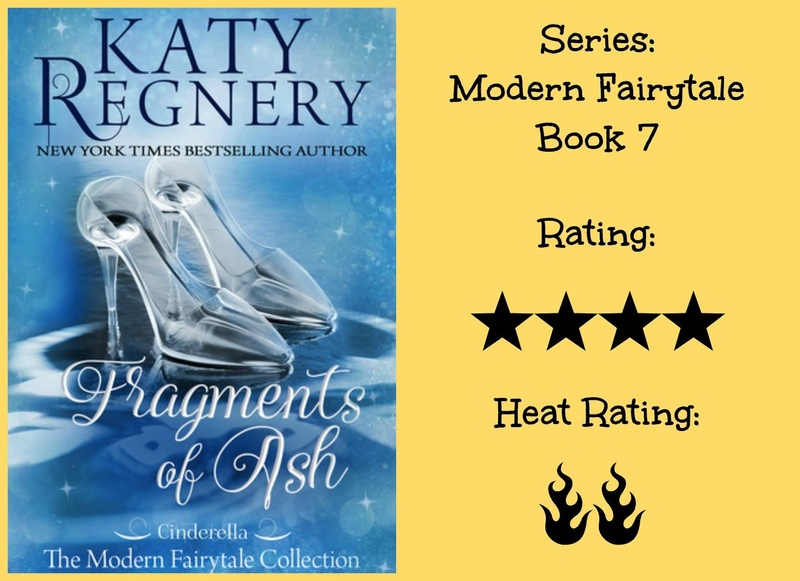 Fragments of Ash is the perfect modern fairy tale in that it blends the light and the dark to make an unputdownable read but it was not an easy one. In the beginning, the book made my skin crawl to a level that I wasn’t actually sure I wanted to keep reading such was the utter wrongness of the situation Ashley finds herself in. 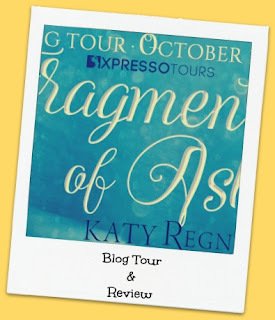 However, I've been a Katy Regnery reader for quite a few years now. I know that she writes beautiful romances and I know there is always a happy ever after, so I pushed through the creepiness and went on a journey with Ashley as she runs towards her god-father (a fabulously camp character called Gus) and his partner who rally to protect Ashley against her step-father's evil plans. Through her fairy godfather(s) she meets Julian who, while initially a little bit beastly, quickly becomes a perfect prince charming and who I fell a little bit in love with alongside Ashley. The book isn't a story of unexpected twists and turns and crazy action. It's a calm and steady story of a lonely girl, growing up in a messed up world, finding love where it wasn't expected: In more ways than one. In fact, it's an absolute credit to Katy's writing that she is able to so perfectly conjure feelings with her words... I could feel the innocence and kindness of Ashley, the wounded wariness of Julian, the fatherly love and affection of Gus. I felt dirtied by the twisted wrongness of the step-father and heart-broken by the contents of her mother's journal. Cinderella will never be my favourite fairy tale but this re-telling is most definitely one of my favourite re-tellings. So, why not the full five stars? Well, Ashley's age made me tweaky considering the step-father's intentions towards her. It was just gross. I get that that was the point but it turned down my enjoyment a notch. I also had issues with the strict Catholic school Ashley went to and the threading of the strong religious belief throughout the story. Once again, I get why Ashley was sent to the strict all-girl Catholic school and I understand that - along with her early upbringing and experiences with her mother - that the school would shape who she was as a person but overt religiosity gets to me even when it's portrayed tastefully and without judgment the way it is here. All in all, I really enjoyed this book and highly recommend it to those who love a good fairy tale. Sweet and fairytale-like. Perfect fit for a Cinderella retelling! It doesn't capture the dark and gritty undertones of this book but it perfectly captures the giddy romance and innocence of Ashley. I've been reading more retellings lately with my book club, so I'm glad to hear you liked this one, especially since Cinderella stories aren't your favorite! Thanks for sharing. I feel like I've seen Regnery's books around for years but I have yet to try one. I like that this one can stand on its own and you don't need to have read the previous six books (thank goodness!). I'm a sucker for dual POVs so big bonus points for that. I'm a bit concerned about the religious theme (usually a big turn-off for me) but I'm still intrigued enough by the story line to give this one a closer look. I've never read this author but this story sounds good.